One of the remaining prerequisites to getting the sheeting on the walls of the building is that the grading around the building is too high. 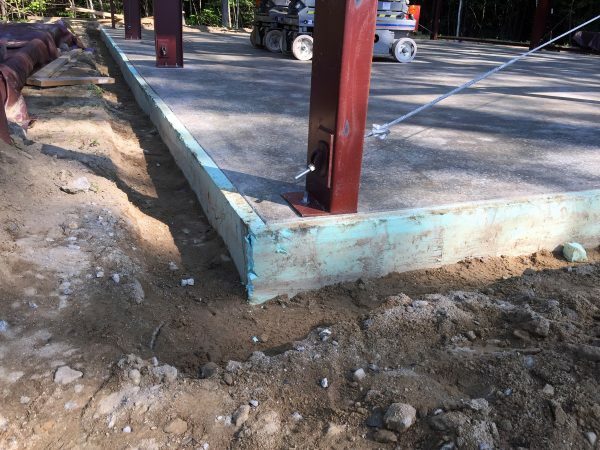 After the slab was poured, the concrete forms were removed and insulation was installed around the perimeter the grading crew back-filled the foundation, leaving only about 2 to 4 inches of drop from the surface of the concrete to the dirt. Upon closer inspection of the plans, I noticed that I needed much more than that. However, using a tractor to lower the grading was not a viable option because siding and roofing materials were still being stored around the perimeter and they are extremely heavy. So, I decided to simply dig out some of the back-fill so we could get the walls and roof on, and then the rest can be done by machine. It’s been quite hot lately, so I’ve been doing a little each morning while the building site is still cool and shady. Digging ditches is hard work. This is especially difficult to dig by hand due to the large rocks that are densely packed into the soil. The process I used was driving the shovel along the insulation, levering the soil away, removing large rocks by hand and then scooping the loosened soil away. I also was able to complete the remaining knock-in bridging today, partially in the morning, and partially in the evening. The only red steel parts left are two flanges for installing the doors, which will be used tomorrow morning. After that, it’s all doors, sheeting and insulation!